Are you eating the right foods before & after workouts? Many times, I hear people say that they skip meals before they workout because they don’t want to be too full, they’re not sure what to eat, or they think they’ll burn more calories on an empty stomach. Not eating before exercise can make you feel tired faster and therefore can actually sabotage your workout. Food is fuel – and the right stuff energizes your body to exercise longer & harder so you’ll get results. Overnight Oats: Oats are filled with fiber, so they gradually release fuel into your bloodstream, and help you maintain a steady flow of energy throughout your workout. Chilled overnight oats are a fun and convenient alternative to traditional hot oatmeal. To make, just mix 1/2 cup rolled oats with 1 cup of your favorite milk and let them soak in the fridge overnight. Then top with your favorite nuts & fresh fruit and enjoy. Raisins: Studies show that raisins can work just as well as sports gels as a natural way to fuel your muscles. Aim for 2 tablespoons—or about 30 to 40 raisins. Pomegranate Juice: A recent study found that the healthy compounds in pomegranate juice, called polyphenols, may help decrease muscle soreness. Post-workout snacks are just as important as the foods you eat before you hit the gym. They can help reduce soreness and inflammation and restore energy. The best recovery combination for your body is lean protein to repair muscles and carbs to replenish energy stores. Tuna: Your body is craving protein to repair muscles after a vigorous sweat session. 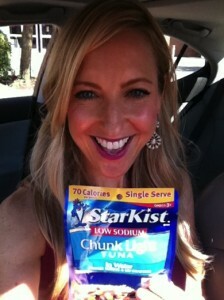 One of my favorite tuna snacks is StarKist Tuna Creations®. The pouches are super convenient and come in a variety of flavors, like Sweet & Spicy and Ranch, and all are 110 calories or less. Each provides 12-16 grams of protein and is a natural source of omega-3s fats, which may decrease the amount of fat your body stores and may decrease muscle soreness. Iced Latte: Believe it or not, this coffee shop treat is a refreshing option after exercise. Milk is the secret ingredient since it has both the protein and carbohydrates your body craves post-workout. Green Smoothie: A new study found that a healthy compound in leafy green vegetables helps muscles work more efficiently. In a blender, puree 1 cup of leafy greens, 8 ounces of low-fat milk and 1/2 cup frozen unsweetened berries. Last, but certainly not least, drinking plenty of water is vital. If you’re not fully hydrated, you’ll get tired faster and increase your risk of injury. Aim to drink about 8 to 16 ounces during a 30-minute workout. Remember, the foods you eat before and after a workout are just as important as the workout itself. By fueling your body with the right foods, you’ll be able to get the most out of your exercises and be on your way to a healthier you! If you’re like me, you’re making the most of the nice weather with beach trips, poolside hangouts and fun vacations with family and friends. In celebration of all the fun the summer season brings, my friends at StarKist are running fun #CharlieOnTheGo photo sweepstakes on its Facebook page. Simply snap a photo with a StarKist product or show off your Charlie the Tuna®-inspired style, and share with tag #CharlieOnTheGo for a chance to win prizes. What do you think of MY tuna-tastic selfie? For more healthy inspiration and recipe ideas, check out StarKist.com and Facebook.com/StarKist! 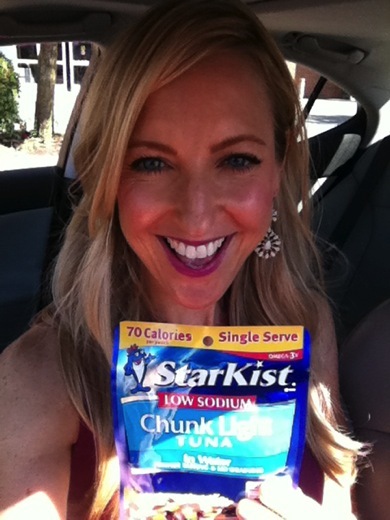 Dawn Jackson Blatner, RDN is a personal fan of tuna and paid spokesperson for StarKist.